For nearly two weeks, temperatures here in New Jersey have hovered in the 90s. In some cases, they got quite close to 100. That's without the heat index. And we haven't even mentioned the high humidity. That's a beastly heat when you're human. But when you have to walk around all day wearing a fur coat, it has got to be downright unbearable. We're lucky enough to have a pool in our backyard, and that helps the people cool off. But none of my dogs like to swim...and 2/3 of them don't even like getting their feet wet. (The boys have an issue with water.) So Lilah, Jasper and Tucker have to find other ways to keep cool. With her glossy black fur, Lilah probably feels the heat the most. 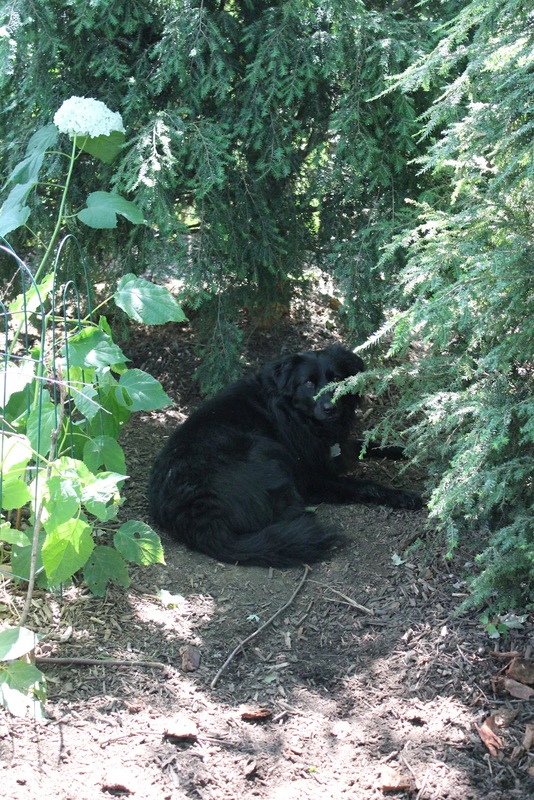 Which is probably why she's the first to seek out cool, dark and shady spots in our yard. The first place to try is under a tree. And we have plenty of them. 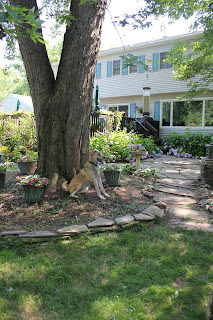 Often, I'll find Lilah under the large split-trunk maple by our shade garden. This is one of the reasons I cannot grow pretty flowers under the tree. Unless they are in pots, they will get smushed. And trampled, too, as the dogs chase critters up the trunk. Lilah relaxes in the shade of our large maple. Lilah has also discovered that dirt itself is cool. And mud is even cooler. Don't be fooled by Lilah's sweet and delicate demeanor; she is quite happy to lay in the wet mud. Who cares about being ladylike when it's hot out? Lilah in a mud patch. For years we tried to grow grass in this spot--and only succeeded this year by laying sod. That's okay; Lilah will find mud elsewhere. Jasper isn't as quick to find shade. For him, I think, comfort is the most important requirement for where to rest--and by comfort he means soft and cushy. 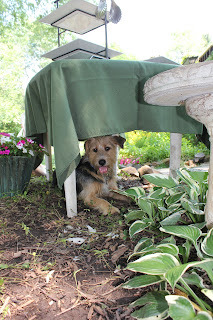 Jasper would prefer a comfortable spot in the shade. With cushions is Best. The ultimate in shady relaxation for Jasper: a cushy bed with a canopy. Not sure about the fact that it swings, but it sure is Comfortable. Not quite as comfortable is Jasper's Outside Bed. The other dogs sometimes use it, but it is Jasper's. However, it only works when the deck is in the shade, which only happens in the very late afternoon and evenings. 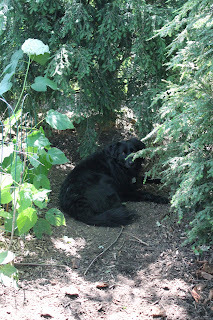 Even though the bed is raised off the deck (and thus cooler), in the heat of the day, it's still too hot, and the poor dog has to go somewhere else for less comfortable, but cooler accommodations. Jasper relaxing in his Outdoor Bed. In the late afternoon, when the sun goes behind the trees, the dogs will often gather on the deck. They all have their Special Spots: Jasper on his Outside Bed, Lilah on the bench, and Tucker next to the bench. 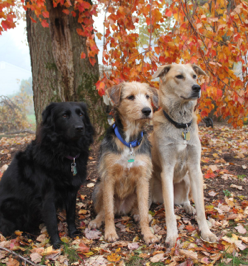 Jasper, Lilah and Tucker on the deck in their Spots. Notice the ever-present Ball by Tucker. 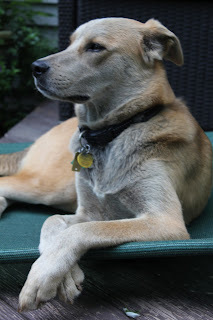 When he gets really hot, Jasper will look for Lilah; he knows that she will find the coolest place in the yard. Lilah resting; Jasper standing guard. The shade garden itself, along with the patio, offer plenty of opportunities to locate a few cool areas. Jasper demonstrates again why flowers have to stay in pots around the maple. Lilah and Jasper relax. Tucker, as always, is on the move. He rarely sits still. Lilah is one cool cat, hanging out on the wall. 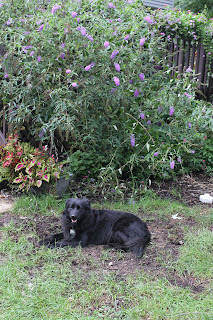 Lilah dug out a little bed between two lilacs. Lilah often seeks the cool under pine boughs. Tucker giving The Ball a rest. There are other creative ways to find shade or to cool down. 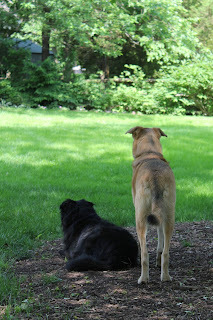 While Lilah heads directly for the trees or the dirt, Tucker tends to come up with more interesting solutions. Like under a table at a picnic. Tucker finds a cave during our 3rd annual family reunion. And if you're thirsty, who needs an official water bowl? A bird bath will do for Jasper and Tucker. Lilah, however, prefers a water bowl or pitcher. She's a bit of a traditionalist. A quick sip at the bar...er...bath. Of course if you're really thirsty, a Giant Water Bowl is okay, too. As we've seen in previous posts, Jasper and Tucker don't like to get their feet Wet. They'll drink from the dog pool, but will only put their paws in when lots of Treats are involved. But Lilah loves to play in her pool, and takes a dip now and again, walking in the pool with her nose in the water and blowing bubbles. Water dripping from her muzzle, Lilah prances through her pool. Now that's how you cool off. While the dogs love to be outside, we're quite mindful of the heat, and when it gets too toasty, the hot dogs spend more time in our air-conditioned home. Smart Lilah, who usually is the last one to come inside on any other day, will ask to be let in when Mother Nature has turned up the oven to Broil. She knows how to chill.